Think of Barcelona and Antoni Gaudí almost inevitably comes to mind; the flamboyant legacy that the Spanish architect left behind has turned Barcelona into an imaginative city that is unlike any other. So it was with great relish when an architecture aficionado and art collector came to own an apartment housed within one of Gaudí’s inspiring structures. Located in the Eixample district, it’s situated in a remarkably well-preserved building that’s the first that the architect had authored in the neighbourhood. The Istanbul-based homeowner admires the stained glass windows and ceramic mosaic tiles characteristic of the Art Nouveau period and was filled with joy to find these features in this building, along with the vaulted ceiling, a forged iron elevator, coffered wooden doors and other architectural details. The passage of time however, had done some damage (although not irreparable) to these original elements of the apartment’s interior, which required careful attention. The owner looked to multidisciplinary practice Mimouca Barcelona Studio to renovate and restore the interior’s historic features, while adapting the space to the modern needs of his family. “The objective was to preserve the original elements of the building and to restore their magnificence,” shares Marta Casas, the founder of Mimouca Barcelona Studio.Together with her team of eight, Casas selected colours, materials and lighting pieces that enhance and highlight the apartment’s period features, while conveying a sense of modern elegance. One of the key features of the apartment is its Nolla mosaic flooring, which was popularised in Spain by Meliana factory owner Miguel Nolla during the 19th century; these ceramic tiles are best known for its complex compositions of various geometric patterns. As the apartment is housed in a conserved historic building, state regulations require the complete restoration of the floor tiles in its original locations which include the bedrooms, kitchen as well as the dining and living areas. “The design had to be comfortable, sophisticated and luxurious, and at the same time complement the Nolla mosaic tiles,” shares Casas. The studio saw the requirement more as a source of inspiration than a restriction—the distinctive colours and prints of the ceramic tiles influenced the overall design of the interior scheme. The team selected earthy shades to complement the hues found on the mosaic tiles and applied it onto the walls, cabinetry and carpentry throughout the apartment to draw attention to its unique flooring. The existing hydraulic tiles at the entrance, hall, laundry area and the guest bathroom are modern additions that had become damaged in recent years; these were replaced with parquet flooring to bring a sense of warmth to the interior. Terracotta brick flooring was also installed in the balcony of the home to complement the material palette. Iron and brass fittings as well as most of the original doors of the apartment have been restored and cleaned, and the carpentry repainted in a glossy varnish that’s the same shade as the walls. The stained glass found in the hall, rooms and main staircase have also been painstakingly restored by local conservation specialist Gisela Bosom, who had to manually remove the older coats of paint and repair the broken pieces to return this decorative feature to its original splendour. To adapt the apartment for the family’s needs, the studio tore down partitions in the kitchen, dining and living areas to create a new open-plan layout that expanded the sense of space in the home. 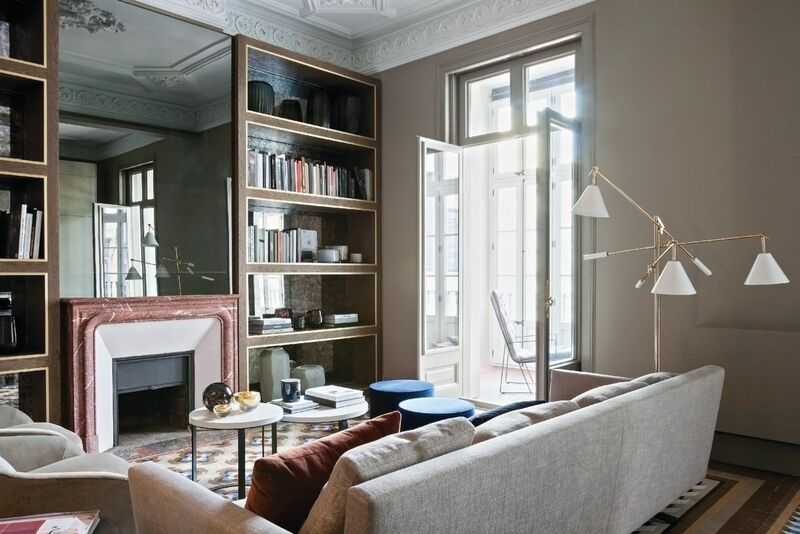 The focal point of the living area is a beautiful Valencia pink marble chimney, which is flanked by bespoke oak bookshelves and brass detailing. A sofa from Casadesús and vintage armchairs decorate the living area, while the kitchen features built-in cabinetry in a varnished finish that’s used throughout the apartment; black kitchen taps from Dornbracht add a modern touch. Bespoke touches in the home’s social hub include a brushed oak table designed by the studio for the dining area as well as a custom-made lamp, and dining chairs from Andreu World reupholstered in a fabric inspired by the mosaic flooring. In the master bedroom, full-length glass doors partition the bathroom from the bed, which features an upholstered headboard framed in brass. The walk-in wardrobe has been integrated into the bathroom to maximise the use of space within the apartment. Clad in Italian stone, the double basin vanity unit is fitted with grey cabinetry to give the couple ample space for their toiletries and grooming needs. Built-in task lighting provides illumination in the bathroom while adding to the streamlined design of the space; separate partitions for the shower and toilet feature a minimalist monochromatic scheme.